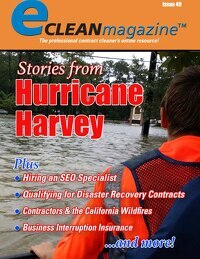 Last week, I surveyed eClean readers to find out which add-on services they would like to know more about. Professional holiday lighting was one of the top responses. Now, for the good news. Even though you’re getting a late start, you can still get your feet wet in this field this season. Think small, work smart, and move fast. Holiday Lighting Safety Guide for Your Customers. You can hang holiday lights for customers. You (probably) cannot provide the holiday lights yourself. Your best bet is going to be to hang lights for customers who already have their lights on hand. While yes, you can run to the local box store and pick up lights, that’s going to add significantly to your time and costs, as opposed to if you pre-ordered your lights months ago and had them on hand, ready to go. That said, most potential customers have not started hanging lights yet. Give them another week and that will no longer be the case. So get started TODAY. When marketing your services, focus on SAFETY and COMFORT. It’s already cold out there, which is good news for you. Homeowners generally aren’t looking forward to getting out there and hanging lights in the freezing temperatures. Second, most would prefer not to have to risk their necks climbing up and down ladders if they don’t have to. To help with your marketing, I put together two documents last year that you can download and give to potential customers and/or place on your website/social media. The first is on holiday lights and the second is on holiday safety (decorations) tips in general. Remember, what goes up at least should come down. Yes, there are homeowners who just keep their strings of unlit lights dangling around their roof line all year long. That’s probably because they don’t want to have to get back on that dangerous ladder and take them down, then redo them again next year. (And this might be someone you need to contact!) But for the most part, homeowners will want those holiday lights taken back down after the holidays are over. Just like a Christmas tree is more fun to set up than it is to take down, so are those exterior holiday lights. Only, unlike that tree, those lights require the risk of climbing back up on a ladder. So even if you don’t get paid to put them up, you can potentially make money taking them down. PRACTICE, PRACTICE, PRACTICE. You may not be able to make a dime off of holiday lighting this year, but you can still hang lights on your own home and on your friends’ and family’s homes either for free, or for a fraction of what you would hope to charge next season. Then next year, you will have a good idea of what’s involved, how long it takes, and how much to charge, plus you can promote yourself as “experienced” – because you will be. Like anything, you’ve got to determine how much you need to earn to actually make money. If you are hanging holiday lights, you’re most likely going to be taking down holiday lights. Keep that in mind when giving a price because you’re talking about two trips, not just one. In researching how much companies charge to hang lights, the general answer is anywhere from $100 (for a “tiny” house) to $1,000 or more. It’s going to depend on the size of the home, the height of the home, and how elaborate the display is. Also, the cost is usually about twice as much when the customer purchases lights from the professional. Again, beyond that, it’s just figuring out what you need to make per hour — and practicing can give you a better understanding of that. 1. Make a Plan. 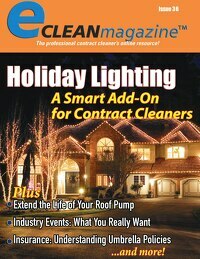 Find out where the customer wants lights hung (or make suggestions), map it out, measure it, and plan accordingly. 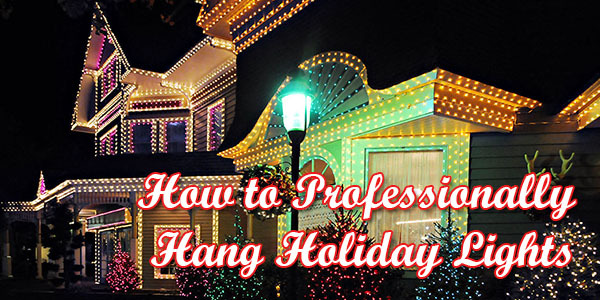 Holiday lighting experts encourage homeowners to try to balance their lights, meaning lighting the lower half of the house along with the roofline. ChristmasLightsEtc.com offers a calculator to help you determine the needed amount of lights for trees. Make sure your customer has enough lights and that they are rated for outdoor use. 2. Locate the electrical outlet(s). You will need to run a heavy-duty extension cord(s) from a 120-volt electrical outlet that is protected by a ground fault circuit interrupter (GFCI). It’s preferable to use an outlet that is controlled by an on/off switch, or plug into an automatic timer. Use an outdoor outlet, not one that runs from indoors to outdoors. Make sure the outlet has a bubble-type weather-proof cover. To keep from overloading a single outlet, you can also purchase/use power stakes designed specifically for holiday lighting. These go into the ground, include GFCIs, and host multiple outlets. They are available at stores like Home Depot, etc., and run around $25 for a six-outlet stake. Note that the old-fashioned incandescent bulbs (C-7 or C-9) use more electricity than the mini lights or LED lights. For these old-fashioned lights, you really need to watch and make sure you don’t overload the amperes. If your customer has old-fashioned lights, recommend they switch to LED. They are much safer, more durable, longer lasting, brighter, don’t get as hot and don’t use as much electricity. For the sake of this article, I am not going to get into ladder safety. (It will be covered in the upcoming safety issue, in time for you to climb back up and take down the lights.) Your goal is to hang the lights as safely and easily as possible without damaging your customer’s home. There are different types of hangers for different areas of the house. Ideally, you would get these from a professional distributor online, not your local big box store. According to an article by Jason Woodward, author of Starting Your Own Christmas Lighting & Decorating Business, these clips are not more expensive than those at the big box stores, and they work better. But again, we’re battling time this year. Here are the most common surfaces you will find and how Woodward recommends tackling them. 1. For Wood and Asphalt Shingles, Woodward recommends the All In One Clip, which can also be used as a gutter clip. The Original Shingle Tab is designed to be placed under the shingles, as is the Biaxial shingle tab. These are designed to accommodate the C7 and C9 bulbs. 2. For Clay Shingle Tiles, Woodward recommends using the Clay Tile Roof clip. It installs easily and quickly, as one end clips to the clay tile and the other end clips to the light. The clip features built-in ridges to help to hold it in place without requiring excessive pressure that can damage the roofing tile. 3. For gutters, special gutter hooks are available. Also, as mentioned above, the All-In-One Clip works for gutters as well. 5. For Trees and Shrubbery, there are special clips that can be used on small tree branches or trunks that eliminate the need for winding lines around branches. These will not work, however, on larger branches. According to Woodward, this is the one place where it’s actually ok to use staples as long as you remove them after the holiday season. 6. Hot Glue can be safely applied to most surfaces, and can help keep lights/wires in place – especially on rough surfaces like concrete or brick, according to Woodward. Be wary of hot glue on stucco, paint or plastic surfaces, however, because it can cause damage. It’s best to test a small spot before applying the glue to any surface. Finally, when you take the lights back down, it’s important to recheck them then store them properly. Again, go back and recheck each strand, looking for problem areas. One suggestion is to mark any burned out lights with a piece of tape so you remember where they are. Ideally, you would replace the bulbs before storing. Another good idea is to mark the end of each strand so that it’s easy to identify which strand goes where when you return to hang them next year. For storage, there are a couple of possibilities. The best, most professional looking option is to use a special reel used for holding holiday lights. The other option is to cut notches into a large piece of cardboard and carefully wrap the strings around the cardboard. If you’re really serious about getting into holiday lighting, there’s actually a magazine — and an annual convention – for holiday decorators. To learn more, got to www.PlanetChristmas.com. ChristmasDesigners.com not only sells commercial grade Christmas installation products, they have a lot of good articles on their site about lighting. Starting Your Own Christmas Lighting & Decorating Business, a book by Jason Woodward, is available in both printed ($179.95) and pdf ($129.95) versions.